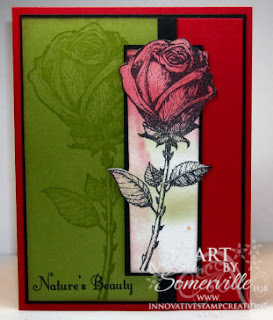 I'm a big fan of flowers - especially Roses, and just love the new Sketch of Roses from Innovative Stamp Creations. On my focal panel, I stamped one of the smaller roses and colored it using the Marker Wash Technique and cut it using the Out of the Box Technique. On the Olive Panel, I stamped the larger Rose using Rangers' new Watermark Resist Pad that will be available from ISC next week. The sentiment was stamped in Black using a SAMJ. Be sure to check back tomorrow for the final June Release from Innovative Stamp Creations. This is so beautiful, Lisa! Love the larger watermarked flower in the background! This is a stunningly beautiful card. I love the way you used those roses. Thank you for your beautiful work. GORGEOUS! I have a weakness for flower stamps....this is a beauty! Just beautiful, Lisa! Perfect colors. Beautiful card and a great stamp.